Voluntar@s en la EURO2012 en Polonia! Desde Ingalicia os animamos a que participeis al proceso de selección para ser voluntari@ durante las EUROCOPA en Plonia el proximo verano. The recruitment process to the project will start in October 2011. During the recruitment candidates will be contacted via e-mail. Candidates may apply to become volunteers until 15 January 2012 by filling out a special electronic form that will be available on the portal. The form will be available in two languages: Polish and English. First-come, first-served order has no influence on further stages of recruitment process. On-line registration is followed by a language test which candidates have to solve; the test will provide a preliminary evaluation of knowledge of English. The test is made up of 25 multiple choice questions and takes around 20 minutes to fill in; its results will be available immediately after it has been finished. Candidates who are successful during the first stage of the recruitment process will be informed via e-mail and invited to the interview to Host Cities marked in the registration form (it is possible to choose one Host City). The invitation to the interview will be confirmed by indicating a date of holding the interview. It will be made possible by a special system available on the recruitment portal thanks to which each candidate will be able to select a suitable date of the interview out of dates provided in the calendar. After selecting the date candidates will receive e-mail with a confirmation and the address where the interview is to take place as well as other necessary information. The aim of the meeting is to meet candidates, learn their motivation, attitude, hobbies and character. Organizers do not cover the costs connected with the recruitment process: transport, accommodation, food. In case of persons living outside the territory of the Republic of Poland organizers provide for a possibility of conducting the interview on-line with the use of communicators such as skype. On the basis of the information gathered during the interview and after an analysis of the form selected candidates will be submitted a proposal of cooperation in the scope of the realization of the project. The information will be sent via e-mail. In order to become a volunteer of UEFA EURO 2012™ Host Cities, each candidate must confirm the acceptance of the invitation and work proposed during the Championships. The last stage of volunteers’ preparations consists in obligatory trainings. They will take place at the turn of May and June 2012. 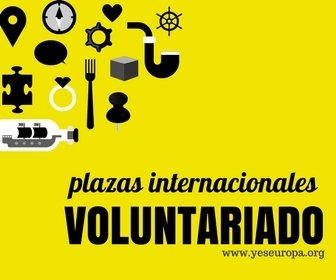 Each volunteer will be informed about the date, time and type of the training via e-mail. Last Minute!! SVE en Polonia, salida en Febrero!